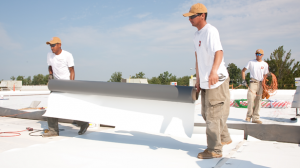 In recent years, TPO roofing has been steadily gaining its share in the flat roofing market. Both commercial and residential customers are increasingly choosing TPO roofs because they are advertised as being similar to PVC in terms of the benefits and installation, but offering a more competitive price. While it is true that TPO and PVC are both single-ply membranes for low slope and flat roofs that have heat-welded seams and are considered “cool”, there are important differences that you need to be aware of before making your purchasing decision. The primary difference is that TPO has been on the market for only about 20 years and has a history of material failures, recalls and formula updates, while PVC has enjoyed a solid reputation in the roofing industry for over 30 years. Initially TPO roofing was designed to be an improved version of both PVC and EPDM rubber membranes, combing the benefits of both, but without the disadvantages. The most obvious similarity is that TPO (Thermoplastic Olefin) and PVC ( Poly Vinyl Chloride) are both thermoplastic materials. Both membranes are heat weldable, which makes them more resistant to leaks than EPDM, because of a reduced number of instances of seam failures. Moreover, like PVC, TPO is considered a green roofing material, and can save you money on your electricity bills, because both membranes are white in color and possess reflective “cool” roof properties. What makes them “cool” is the fact that they are both resistant to heat and sun’s ultraviolet rays and are able to keep the inside of your home or office space cooler, reducing the need for excessive AC usage. Another major similarity between the two roofing systems is that the installation process is very similar, requiring similar tools, procedures and skills. Both systems can be installed either as mechanically fastened or fully adhered. Both materials share other important benefits, such as resistance to chemicals, grease and oil. They are puncture resistant and can be easily repaired. Also, both TPO and PVC are designed to be flexible to conform to the movement of the roof. TPO vs PVC based on price – is TPO really cheaper than PVC? While PVC MEMBRANE is more expensive than TPO, per square foot of same thickness material, the overall system costs is about the same, or even in favor of PVC. Therefor we can answer the above question in two ways. 1) Cost of materials when you consider everything is about the same, as we explain in out TPO Prices guide (updated on July 20, 2017). 2) Total installed cost may be in favor of TPO, because contractors just put more markup on PVC (extra profit). Labor is the same for both systems, or even more intensive for TPO, because of glued seams, that were introduced by TPO manufacturers in the past 10-12 years (in leu of failures of welded TPO seams). In the end – since materials and labor costs are the same (or should be the same), TPO does not have any price advantage over PVC. However, if you get different quotes, discuss with your roofer that their costs are the same, and why are they charging more for PVC. The most significant difference between PVC and TPO roofs is their chemical makeup. TPO was designed to be a superior material to PVC. However, because the goal was to make TPO cheaper, the final formulation of the membrane turned out to be substandard. PVC roofing membranes maintain their flexibility because the formula contains plasticizers, as well as salt derived from chlorine.The disadvantage of this formula is that with time these plasticizers tend to break down, weakening the membrane so that it requires maintenance and repair in order to remain in tact and resistant to leaks. Moreover, PVC contains other chemcial materials that also break down over time, causing tears in the membrane. TPO has a different formula that does not require the addition of plasticizers to remain flexible and also utilizes materials that are not supposed to break down over time, thus offering greater long term durability than PVC. However, the reality is that instead of being superior to PVC, TPO ‘s formula has provided very inconsistent and often disappointing results. Over the years, a number of issues have surfaced with TPO membranes, putting their promise of durability into question. For example, there have been many documented instances of seam and material failures, such as membrane curing and cracking, which even resulted in massive recalls of the product. Additionally, particularly in the Southern states, which get intense heat and sun exposure throughout the year, TPO roofs have been documented to weather at an accelerated speed when subjected to high thermal or solar loading. Also keep in mind that because currently there is a hot growing market for TPO, a lot of manufacturers are producing and selling their own formulations of the product. However, not all formulations work equally well, and not all of them conform to the ASTM standards. If you decide to go with a TPO roof, it is in your best interest to purchase one from a manufacturer who has been producing these membranes since their inception, another words, for at least 20 years. You will not have to face these issues with a PVC membrane, as the formula has remained consistent for many decades and has a proven track record of durability as well as warranty to support it. In fact, commercial and residential roofing industry in Europe continues to choose PVC for their flat roofing needs. While PVC requires a bigger financial investment, you are guaranteed the peace of mind of investing into a trusted and tested product. As a result of the numerous reported problems and recalls of TPO roofing, manufacturers are continuing to work on improving its chemical formulation, and are releasing updated versions of the product. It is highly likely that in a few years manufacturers will be able to achieve their goal of offering a high quality membrane comparable or even better than PVC, but at a more affordable price. 1) the goal is still to maintain a competitive price advantage over PVC, which makes the quality of TPO questionable. 2) Even if the new generations of TPO are in fact superior to PVC, there is no way to know this for sure, as the oldest working TPO membranes across the US are at best 15-20 years old. Carlisle started to make their own TPO in 1997. GAF around 2000 and Firestone bought the Serrot plant and business in 2002. Firestone bought the TPO formulation that Serrot had used to produce for Carlisle, GAF, JM, and Firestone as well as the original line so Firestone actually has the oldest performing product. PVC is not considered green, never will be. All of the people here talking about how great a product PVC is are leaving out the fact there were millions of square feet of PVC failures in the 80’s, especially in the south. With Elvaloy, PVC is a decent product. Without, using liquid plasticizers, you are asking for trouble in southern climates. Liquid plasticizers migrate toward heat. Even running a welder on the seams of a liquid containing product can be an issue.. Correctly formulated, TPO is the superior product. By nature of the product all TPO membranes manufacturers are using TPO pre compounded by manufacturer of the raw material. TPO is supplied in form of pellets, which are extruded or calendered into sheet. The only thing manufacturer can do is to add pigments, and UV stabilizers to the stream of TPO. However these ingredients are also supplied from outside in the form of colour and additives masterbatches manufactured by additives and pigments suppliers. Because nothing revolutionary new in the field of the UV and thermal stabilizers had appeared in the last 15-20 years at least, and there are 4-5 suppliers on the market, not counting Chinese copies, all manufacturers of the TPO membranes are offering products varying marginally. PVC membranes containing Elvaloy are expensive, because Elvaloy is a very expensive staff by itself, and it’s content is between 40 -50% of the formulation. Carlisle and Firestone have been making their own TPO for about 17 years. Formulation changes are next to impossible to track, unless the manufacturer’s report them, but it is known Carlisle did reformulate in the mid-2000. GAF makes their own TPO, and JM makes there own (since 2009 or so). JM sources their two PVC sheets from Cooley (elvaloy PVC) and i2M (plasticized PVC). Just to add clarity. I used to live 2 miles from Cooley plant in Pawtucket RI … they actually make roofing for many other private labels, on and off … not just JM… They used to sell direct to Target … I don’t know if they still do. I don’t understand why none of the other roofers I had spoken with ever mentioned PVC. The only conversations were about TPO or EPDM. EPDM always got nixed early in the conversation since the seams weren’t welded. B) if supplier does sell PVC, it’s usually 20% more expensive (per sq. ft.), BEFORE roofers think of the cost of other accessories. So they think – “aha, i can get TPO for $0.67 vs PVC at $0.82 per square foot. It will be easier for me to sell TPO”. But reality is, when you calculate all the extra nonsense items that you MUST use with most TPO products, they actually cost the same, and PVC is EASIER to install. Here is why: Many TPOs, especially those from Firestone / GenFlex / RPI (all 3 brands are made and owned by Firestone) require installer to us PEEL & STICK flashing tape / primer around roof perimeter, which adds about $3.50 per linear foot of roof edge in materials. I explained this in my TPO roof prices guide, where I provide actual supplier quotes, that show how much accessories really cost, and why TPO is not less expensive than PVC. 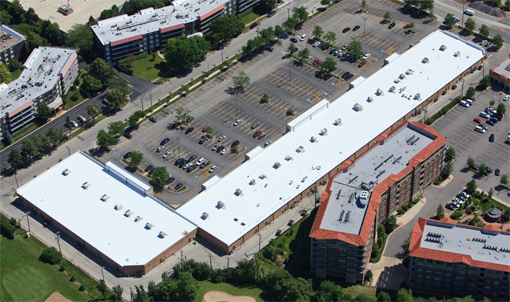 Now when you look at large commercial projects – TPO is less expensive, because you have 100000s of of square feet, where $0.20 per foot difference makes a huge impact on bottom line, and these roofs usually have parapets, so roofers don’t need to bother with Peel & Stick on roof edge. If they’re only talking about TPO and EPDM, they’re not as educated as most roofers in California. I install IB Roof Systems only. 50 mil PVC over 2” iso bullet proof. I don’t install TPO and EPDM isn’t really out west. Neither JM nor Firestone have been making and selling their own TPO for 20 years. Carlisle made JM’s TPO until JM opened their factory in 2007. Ryan, what about firestone? who’s been making their TPO for last 20 years? what about all the factories they have, putting out TPO? Are you saying JM doesn’t make their own TPO? David, no they don’t. They private label Cooley TPO/PVC (to the best of my knowledge). Cooley is a manufacturer in Pawtucket, RI… I used to live like a mile from their plant. Johns Manville or Firestone, I’ve had a lot of success with these manufacturers. Glad to read your comments. Am thinking that TPO manufactured by a company doing this for 20 years could be a good investment, a good purchase. My question is how to find the companies with this 20 year history of manufacturing TPO. Your assistance will be greatly appreciated. Do you know which companies work on perfecting TPO? How do they judge their formulations? !